Not in Our Town (NIOT) joined Marin residents and leaders for events across the county for United Against Hate Week (UAHW) in November. Marin County played a vital role in United Against Hate week with resolutions and support from the Marin County Board of Supervisors, District Attorney’s Office, Marin County Office of Education, Novato City, Police Department and School District, the College of Marin and Mill Valley Schools. NIOT is proud to announce a new collaboration with Osher Marin Jewish Community Center and look forward to joint activities in early 2019. A panel of young people speak on the action steps they'd like to see from their peers at the NIOT Novato United Against Hate Event . Novato held two events reaching hundreds of residents for screenings of Light in the Darkness and Waking in Oak Creek. 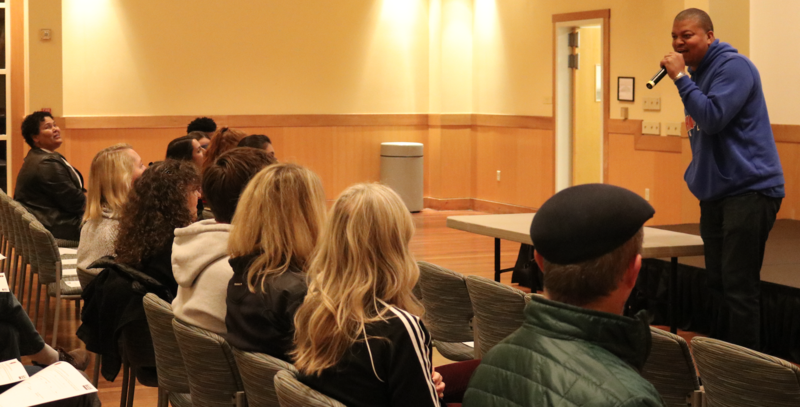 The November 8 event at Unity Church featured a powerful panel of young people who outlined the action steps they’d like to see their peers and community members to take to address the growing acts of racism and disparity they are experiencing. Check back here for a link to the full video of the event. 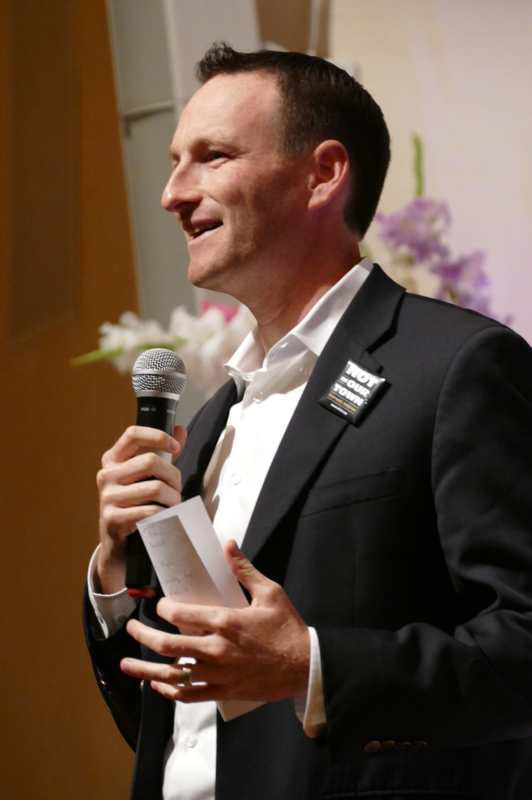 Novato Mayor Josh Fryday shared his support for NIOT Novato at United Against Hate Week events on Nov. 8 and Nov. 10. When NIOT Novato members heard about the possibility of bringing Pardeep Kaleka and Arno Michaelis to a community discussion, they quickly organized an event for their community. Novato City Hall was packed on Saturday night November 10 where residents from across the county viewed Waking in Oak Creek and heard from Pardeep Kaleka and Arno Michaelis, a hate crime survivor and former white supremacist who now work together to stop violence. NIOT Novato Chair Police Chief Adam McGill, Mayor Josh Fryday and School Superintendent Jim Hogeboom encouraged Novato residents to get more involved with Not In Our Town. On November 13, the City Council and Novato School Board unanimously passed a joint resolution to begin the process of becoming a NIOT Gold Star City. These leaders are working together with a powerhouse group of passionate residents who made both of these events successful. about being harassed in the community. In Mill Valley, school leaders organized a screening and community discussion at the Community Center. It was a smoky night as the fires still burned in Paradise, but the sixty people who attended spoke honestly about the challenges of addressing racism, and white blindness. After viewing the Not In Our Town film Light in the Darkness, Glo Robinson led a student panel who spoke about issues of intolerance and segregation at Tam High. Glo is a recent Tam High graduate who has spent the semester as an organizer with Not In Our Town. 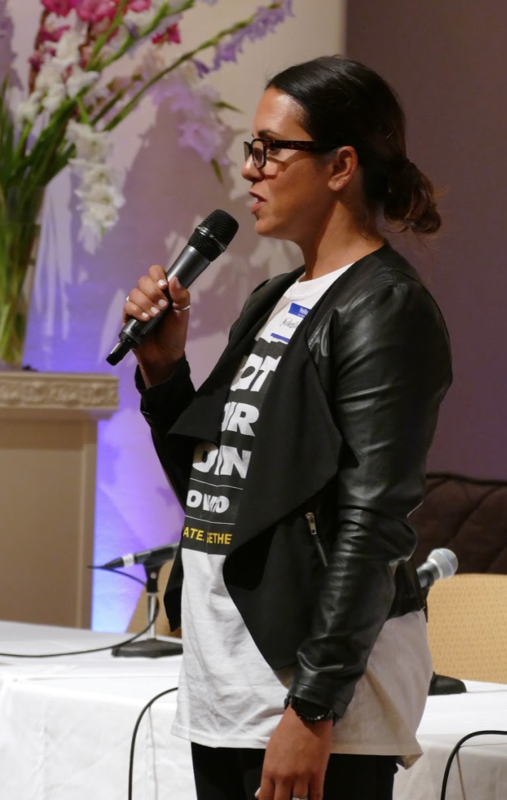 She became involved when she was a panelist a year ago at a NIOT event in Mill Valley shortly after the racist incident at the school targeting Tam High Principal J.C. Farr. Many thanks to Acting Mill Valley School Superintendent Raquel Rose and Amanda Finlaw. The Mill Valley School District joined NIOT and United Against Hate Week as part of their effort “to shape balanced,empathetic learners and an equitable community through building a culture of acceptance, kindness, and understanding.”During the discussion, one resident remembered the difficulties he faced growing up in MIll Valley, and reminded the audience of the work of Jane Elliot, an Iowa teacher who wanted to help her students understand the impact of prejudice. Here is a link to learn more about the Brown Eye/ Blue Eye study. The leader of the Marin NAACP spoke of years of action to address racism in the County. 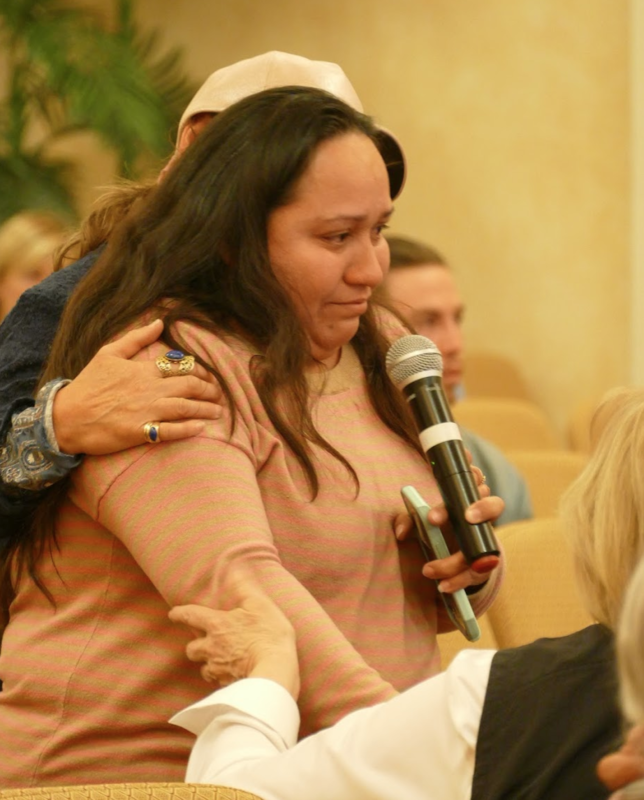 Also during the discussion, one Mill Valley Mom told about her painful experiences as her children faced chants of “build a wall” and what it was like for her when other parents assumed she was her children’s nanny. People in the audience were seeking solutions, one step at a time. A parent spoke about how she and other moms joined together across the district so that children in Mill Valley and Marin City could play lacrosse together. We can only stop hate if we know each other, and find a way to work together. 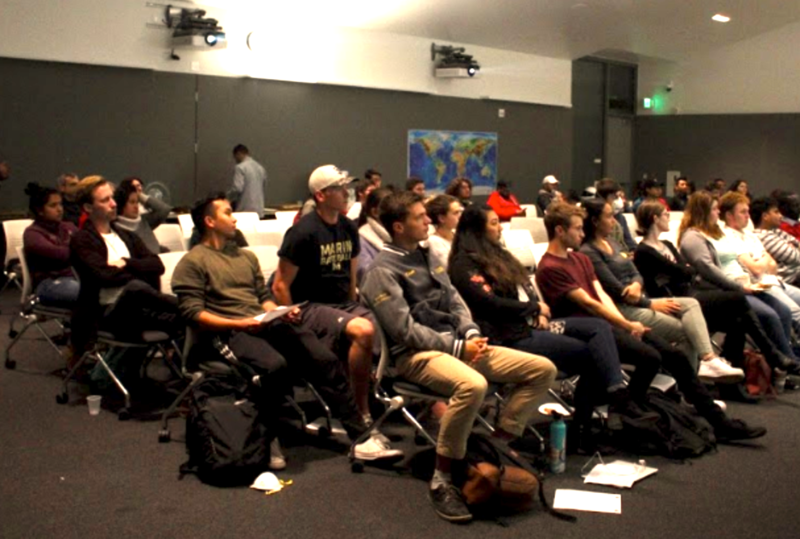 Student leaders and organizers of at the Not In Our Town Novato event on November 8, 2018.